LAM DONG (VNS) — About 400 patients have been treated through stem cell transplant therapy across Viet Nam since the first case was recorded in HCM City two decades ago, a report revealed. The report was shared at a conference focusing on the application of the medical technology, which was held in Da Lat, Lam Dong Province. The two-day national stem cell conference started yesterday, with about 300 Vietnamese and international scientists attending, who are devoted to researching stem cell technology and its potential applications for treating diseases. Fifty-four scientific reports, including those by experts from Germany, Japan and Belgium, the leading nations in stem cell treatment and research, will be presented at the conference. The reports are expected to cover a wide range of stem cell transplant applications, such as those used to treatment diseases of blood, eyes and the cardiovascular system, along with curing dermatology illnesses and burns. 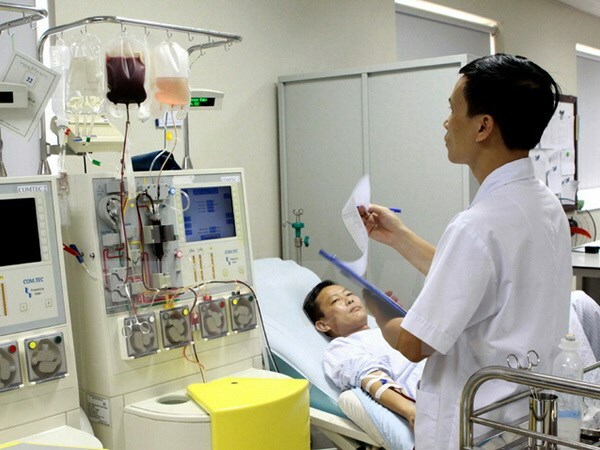 "Stem cell therapy was and is being used to treat various medical fields in Viet Nam, for bringing new hope for a better health of the people," said the National Institute of Hematology and Blood Transfusion Director, Nguyen Anh Tri. So far, stem cell science is reported to have been brought into practical medical treatment at hospitals across the country like in the Central Paediatrics Hospital and the 108 Military Hospital in Ha Noi, the HCM City Haematology and Blood Transfusion Hospital or the Hue City Central Hospital. The establishment of the Community Bank of Cord Blood Stem Cells in Ha Noi last year had also marked a step forward in the development of the stem cell transplantation treatment in the country. The bank will provide better opportunities to the sick to find their matching stem cells, which were previously collected from the community. Two patients have been treated at the National Institute of Haematology and Blood Transfusion using the stem cells taken from the bank, besides another 385, who have received stem cell transplants nationwide so far. "Research and application of stem cell treatment is being done in a systematic way to catch up with the world," said Deputy Health Minister Nguyen Thi Xuyen.